Fans of the beloved ’90s teen sitcom Saved by the Bell have reason to rejoice. Now you too can visit the cool kids’ hangout frequented by Zack Morris, AC Slater, Kelly Kapowski, Jesse Spano, Lisa Turtle and Screech Powers with a Chicago pop-up diner designed to look exactly like The Max. Clearly, there was a lot of attention to detail placed into the design and there are photo-ops galore. While we couldn’t get a dinner reservation (they are still packed! ), we did visit them for late night dining and got to sample their limited menu and specialty drinks. Of course, we could not pass up the opportunity to try the B Ba B Ba Baloody Mary. Our waitress was a bit sassy and informed us that their Bloodies were so good they only needed five ingredients and zero fixin’s to make them the best in Bayside…. We said we’ll be the judge of that. Mix: They whip it up themselves. Chaser: The menu promises a sidecar…. was not offered one! Fixin’s: Self-proclaimed so good they don’t need them. We beg to differ. So, you definitely visit this place for the experience, not the food or drinks. It’s kitschy and super-fun. The Bloody Mary was average and lacking. The late night menu was limited and they only had a few sandwiches…and NO fries. How can you have a late night menu sans fries? Really, no other snacking/apps to speak of either. The other drinks, aside from the clever names, were nothing that you couldn’t get at another bar (probably for cheaper, although that’s debatable in the Windy City). However, all that aside, it’s still worth a visit to the Max. The best thing you can get here is a side of nostalgia and you won’t be disappointed in that. En route to Cincinnati for a conference, I found myself at O’Hare with a healthy layover. Time for a Bloody Mary! After some scouting, it was determined that the best option in my terminal was Stanley’s Blackhawk Bar. 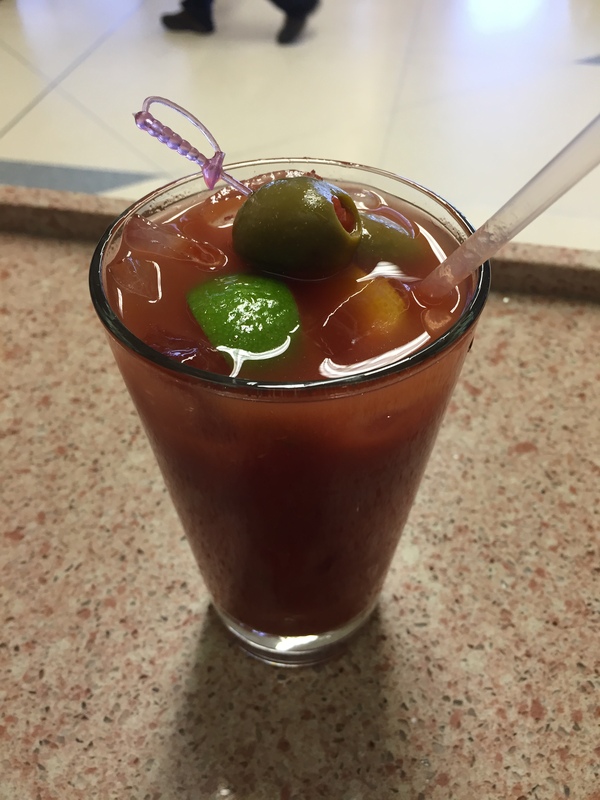 This Bloody Mary was pretty standard, especially when considering this was drink was in the Midwest and an airport, generally two indicators of the chances of getting an above-average beverage. Definitely wouldn’t go out of my way to seek this out next time I was in the airport; I would have been better off with a can of Mr. and Mrs. T’s and a mini bottle of vodka on the plane. 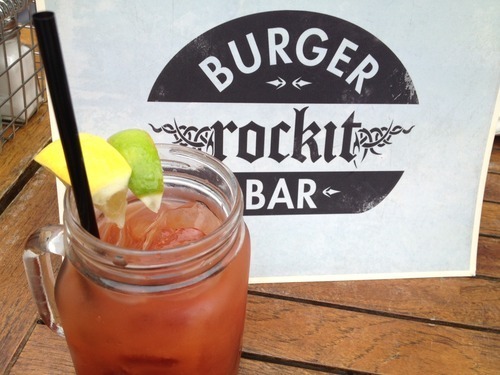 One of the best Bloodies I’ve ever had was at Rockit Bar & Grill in Chicago. Seriously, I’ve considered getting up early some morning and driving there just to have a couple of Bloodies, but then I realized I probably couldn’t drive back right away. So anyway, when I found myself in Chicago for Brewers-Cubs game and some time to spare, I had a Bloody Mary at the Rockit nearby. Granted, this was a Tuesday and far from the $5 Bloody Mary Brunch, but I was very disappointed. For half-price, you can get access to the most amazing BYO Bloody Bar I’ve ever seen on a Saturday or Sunday. I would definitely hold off until then; not worth it at all for this subpar drink on a regular day. For what it’s worth, I had originally visited the location on Hubbard. The one I visited most recently was in Wrigleyville. Shouldn’t make a difference, but that may have contributed to the experience. Wilde Bar & Restaurant in Chicago. 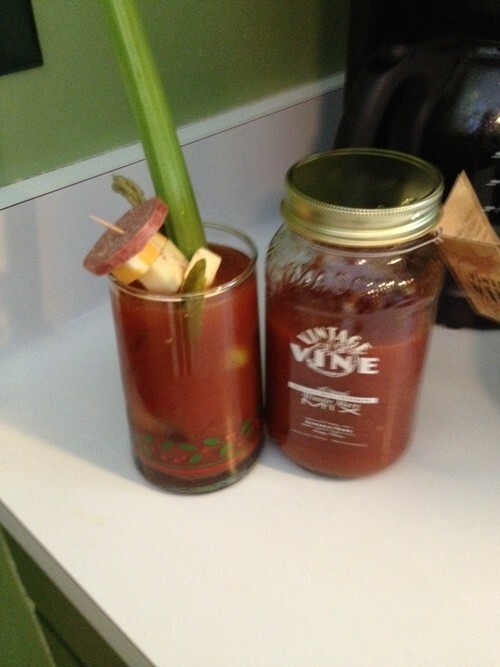 I started this blog because it became known in my circle of friends that I was a Bloody Mary connoisseur. People would come to me for recommendations, ask me to rank my favorites, etc. Thus, it became necessary to formalize my review process in some way. Now, since starting this blog, I’ve often received submissions from friends and family. It seems that when they’re drinking bloodies, they think of me and that makes me feel happy. I asked her to write a guest review. Here you go! Spice/Mix: Molly rated the mix and 8/10… “Just the right spice for me!” she said. 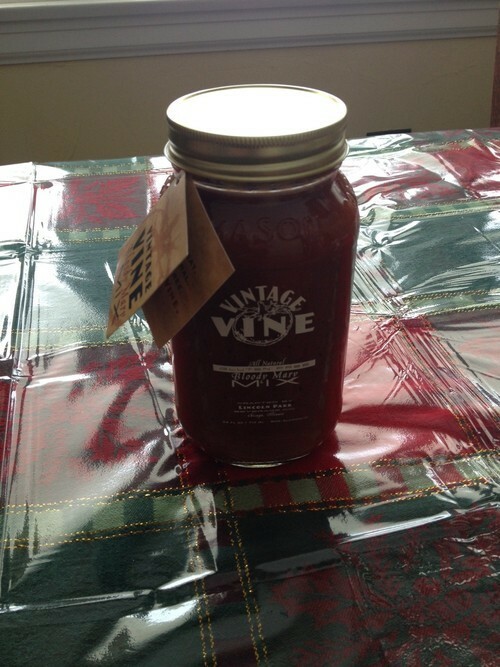 Thanks, Molly, for thinking of me while you were enjoying your brunch, and for adding to the Out for Bloodies blog! Hope you had a nice trip! For everyone else, don’t hesitate to pass your recommendations and reviews on to me! So many bloodies, so little time, I will never get to them all myself! While we’re on the topic of Chicago, I wanted to post this review of Rockit’s Bloody Mary Bar from my trip there in June. This is one of the top Bloodies that I have ever had and I was bummed that I wasn’t there on a Saturday or Sunday during this trip to partake. My trip there was on a Saturday for the Acoustic Brunch. The food was excellent, the music was amazing and the Bloodies were Bloody Awesome! This is by far the largest BYOBMB (Build Your Own Bloody Mary Bar) that I’ve ever seen and, at $5 all day, this is a terrific value. I highly encourage you to check out Rockit next time you’re in Chicago! Or, make the drive down just for the Bloody. You won’t be disappointed! This week, I took a short trip to Chicago for work, so of course I wanted to scope out a bloody while I was here. The only problem was that I wasn’t able to order one until after I got done with some work and met my colleagues out…at a piano bar….at 10pm. For those of you who haven’t been, Howl at the Moon is a piano bar that is popular in quite a few states. It is know for its yard and fish bowl drinks… not its Bloodies and now I know why. I was not very impressed with this Bloody, but to be fair, I also didn’t expect much. Go for the atmosphere instead. Mix: Unsure, but not homemade. It was a bottled mix that I didn’t recognize.